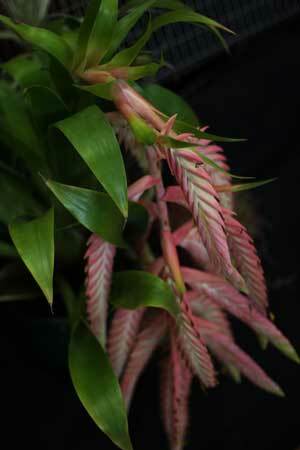 A group of ephiphytic plants, Tillandsias are originally from Central and South America. Tillandsias are very popular for use in vertical gardens and these ‘Air Plants‘ are best grown when protected from direct sunlight. Becoming more popular in Australia, they are easy to grow and long lived, some wonderful flowering varieties are now available from specilaist growers. Some species are much easier to grow than others, some have more spectacular flowers such as T. dyeriana. 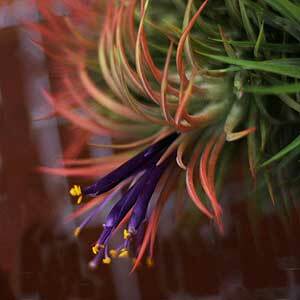 Tillandsia, or air plants, survive by absorbing moisture and nutrients through a coating on their leaves (modified scales). Tillandsias can be attached to a range of surfaces with liquid nails, silicon based glues or plastic coated wire (string will also do but it may deteriorate). Attach the base of the plant (not the roots). Many species seem to grow well when attached to an old tree fern, or piece of wood. Tillandsias require protection from frosts and need good air movement. A spray with water two to tree times a week in summer and a feed with a liquid fertilizer (spring to summer) with 20% strength liquid fertilizer when spraying can help keep the plants healthy. Some varieties are easy to grow in most areas of Australia, other do require warm humid climates to survive. When buying specificc plants ensure that they are suitable for your climate. Tillandsia Aeranthos (picture right) is originally from Brazil and has been happily growing attached to some cork board in a sheltered position under the eves of our shed for a number of years. We give it a spray with some water every now and again, it never fails to flower, and really takes little care at all. T.aeranthos, T.Argenta, T.butzii, T.caput-medusae, T.fasciculata, T.ionantha, T.ixiodes, T.plumosa, T. punctulata, T.useneoides (spanish moss) and T.usneodes are some popular varieties.